Logical and set operations are useful for comparative distribution modelling, to assess consensus or mismatch between the predictions of different models, and to quantify differences between models obtained for different time periods. Fuzzy set theory (Zadeh 1965, Barbosa & Real 2012) allows performing such operations without converting the predictions from continuous to binary, with the inherent application of arbitrary thresholds and over-simplification of model predictions. The result is a continuous numerical value quantifying the intersection, union, sum, or other operation among model predictions, whether binary or continuous. The fuzzyOverlay function, used e.g. by Gutiérrez-Rodríguez et al. (in press) and by Reino et al. (in press) and included in the fuzzySim package (>=1.6), requires a data frame (or a matrix) containing the model prediction columns to compare, an indication of which columns are to be compared (overlay.cols; by default they are all included), and an op indicating the operation to perform between them. Can be ‘consensus‘ for the arithmetic mean of predictions (or the fuzzy equivalent of the proportion of models that agree that the species occurs at each site), ‘fuzzy_and‘ or ‘intersection‘ for fuzzy intersection; ‘fuzzy_or‘ or ‘union‘ for fuzzy union; ‘prob_and‘ or ‘prob_or‘ for probabilistic and/or, respectively (see Details); ‘maintenance‘ for the values where all predictions for the same row (rounded to the number of digits specified in the next argument) are the same. If data has only two columns to compare, you can also calculate ‘xor‘ for exclusive or, ‘AnotB‘ for the the occurrence of the species in column 1 in detriment of that in column 2,’expansion‘ for the prediction increase in rows where column 2 has higher values than column 1, ‘contraction‘ for the prediction decrease in rows where column 2 has lower values than column 1, or ‘change‘ for a mix of the latter two, with positive values where there has been an increase and negative values where there was decrease in favourability from columns 1 to 2. You can install and load fuzzySim (>= 1.6) and then check help(fuzzyOverlay) for further info and reproducible usage examples. Metrics for quantifying the similarity among ecological niche models are important for testing patterns of niche evolution. The modOverlap function, used e.g. by Reino et al. (in press) and now included in the fuzzySim package (>=1.5), calculates three such metrics: Shoener’s D statistic for niche overlap, Hellinger distance between probability distributions, and the I similarity statistic of Warren et al. (2008). These formulas are also implemented e.g. within the niche.overlap function of R package phyloclim, but there they require input data in complex and software-specific formats. The function below calculates these indices from simply two vectors or columns containing the predictions of the two models to compare. See also the fuzSim function in the fuzzySim package, which calculates fuzzy versions of classic binary similarity indices such as Jaccard, Baroni-Urbani & Buser, Sorensen and Simpson (Barbosa 2015). The summary of a model in R gives you a table of the coefficient estimates and other parameters. Sometimes it may be useful to have a string of text with the model’s equation, so that you can present it in an article (e.g. Real et al. 2005) or apply it in a (raster map) calculation, either in R (although here you can usually use the ‘predict’ function) or in a GIS software (e.g. Barbosa et al. 2010). The getModEqn function, now included in the modEvA package (Barbosa et al. 2014), gets this equation for linear or generalized linear models. By default it prints the “y” linear equation, but for generalized linear models you can also set type = “P” (for the equation of probability) or type = “F” (for favourability, which corrects the intercept to eliminate the effect of prevalence — see Real et al. 2006). If the variables to which you want to apply the model have a prefix or suffix (e.g. prefix = “raster.stack$” for the R raster package, or prefix = “mydata$” for a data frame, or suffix = “@1” in Quantum GIS, or suffix = “@mapset” in GRASS), you can get these in the equation too, using the prefix and/or the suffix arguments. Jiménez-Valverde A. & Lobo J.M. (2006) The ghost of unbalanced species distribution data in geographical model predictions. Diversity and Distributions, 12: 521–524. The plotGLM function, now included in the modEvA package (Barbosa et al. 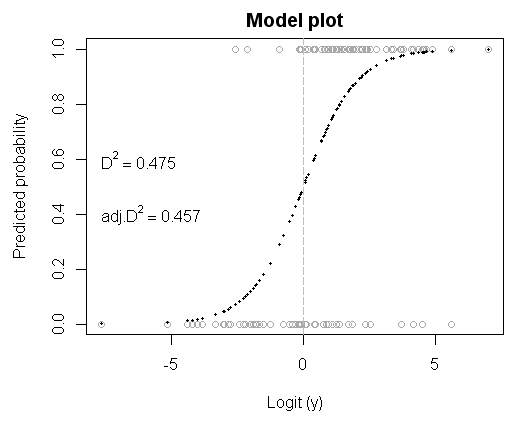 2014), plots the observed (presence/absence) data and the predicted (probability) values of a generalized linear model against the y regression equation (logit) values. For now, it works only for logistic regression (binomial response, logit link). Optionally (if plot.values = TRUE) it can display in the plot the proportion of deviance explained (Weisberg 1980, Guisan & Zimmermann 2000), but this requires that the Dsquared function is loaded, and that a model object is provided (rather than just the observed and predicted values) if you want the adjusted deviance as well. # model: instead of (and overriding) obs & pred, you can provide a model object of class "glm"
Grey circles are the presences (0) and absences (1); black dots are the corresponding predicted values. The vertical line at y = 0 corresponds to a predicted value of 0.5 (inflection point). You can add a legend and also alternative or additional titles and labels to the plot, e.g with arguments legend, ylab, xlab and main (see ?plot).